What a blur of a two weeks it's been since I last blogged! Offramp Gallery participated in our first art fair, we prepared for an upcoming show at the gallery, and sadly, I lost a good friend, artist and former painting teacher, Aron Goldberg. As a tribute to Aron, a gifted artist and brilliant man, I'm posting the following video which was produced as a preview of a 2009 solo exhibition mounted at Offramp called Aron Goldberg, a Life in Self Portraits. Aron was suffering from Alzheimer's at the time (you will see this clearly reflected in his later work) but was still lucid enough to appreciate and enjoy this last exhibition of his work during his lifetime. R.I.P dear Aron. 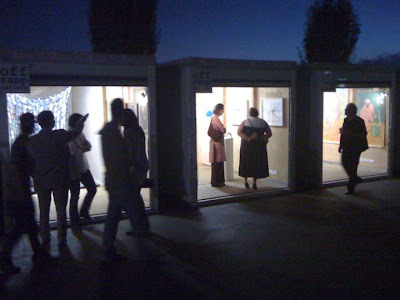 The fair that Offramp participated in was Flag Stop Art, An Alternative Contemporary Art Event. It was held at a Lexus dealership here in the Los Angeles area. Inside were curated and juried shows. Outside were 50 storage PODs, which were available at a very affordable price to artists, galleries, curators and artist/curators. Offramp showed its eight represented artists in three PODs. It was a challenge to install in the 8' x 16' spaces, and exhausting work, but very rewarding in the long run. We made a lot of new friends and learned a lot about taking our show on the road. I was asked to speak on one of the panel discussions, The White Walls are Shifting: Innovative Models of the Contemporary Art Gallery. I was specifically asked to speak about Offramp Gallery's business model. A transcript of my remarks follows. I've always thought that art and business make for strange bedfellows. Call me old fashioned, but I still believe that art is supposed to be transcendent, to speak to the human condition and not be all about money -- in other words, it's the opposite of selling cars or hamburgers. It seems to me that the art world has worked very hard in the past few decades to force art into standard business models with an emphasis on branding, marketing, celebrity, trade fairs, investment and profit -- and as a result, we've lost touch with some of the loftier reasons we got involved with art in the first place. That's one of the reasons that I was so happy to be able participate in FlagStop -- it's not primarily commerce-driven. Events like these give artists, curators and galleries a chance to strut their stuff without breaking the bank. That having been said, if you haven't yet seen Offramp's three PODS, we have some very nice things for sale. My gallery experience came from the ten wonderful years I spent working at the Municipal Art Gallery at Barnsdall Park. We all wore many hats at Barnsdall and as a result, I learned just about everything about the logistics of putting together exhibitions and running a gallery. Of course, Barnsdall is not-for-profit, so what I didn't learn at Barnsdall was how to sell art. (All too often it seems as if Offramp's business model is also not-for-profit.) How do you sell enough art to support yourself and your artists without selling out, without seriously compromising your ideals? It's a huge challenge and I'm still working on it. Check back with me in a couple of years and I'll let you know how it's going. 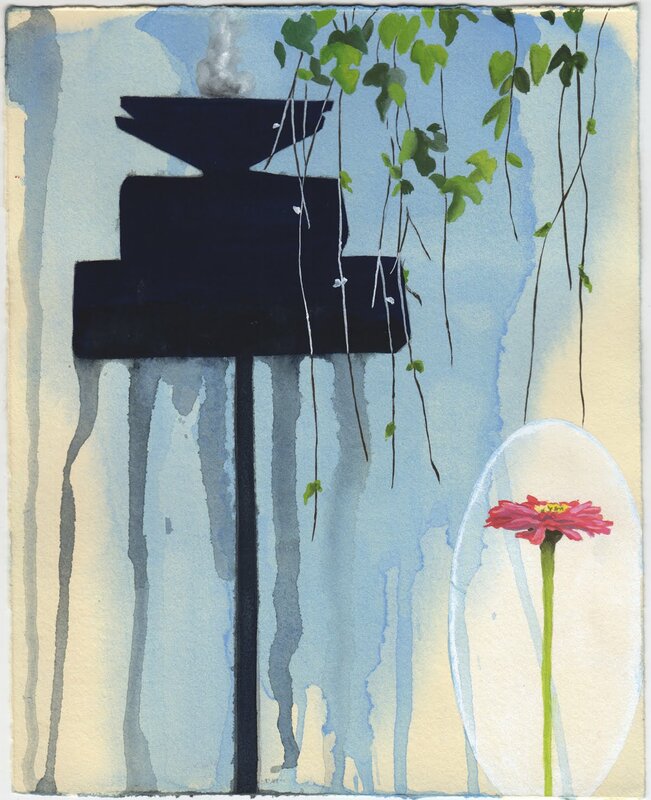 For those of you who don't know, Offramp Gallery is located in a wonderful rambling old house with a large garden adjacent to the 210 freeway in Pasadena. The inspiration for starting Offramp Gallery came as much from the house itself as from my need to do something meaningful with my life. The house used to be a bungalow and a ballet studio which were eventually joined together by a large living room. The old dance studio has high ceilings and skylights and as soon as I saw it I knew it would make a perfect art gallery. The house has a history in the neighborhood as a cultural center and I'm happy to be continuing that tradition. Since Chaz and I live in the house, everything the gallery does -- the gallery, the art, the visitors, and the events -- becomes an extension of our home & social life. It's a wonderful way to live. The art we show is, by necessity, on the smaller side -- it's work that would fit into your home, and that you don't need to build your own personal museum to house. Our overhead is relatively low, since we don't have to pay rent on a separate gallery space and do most of our marketing digitally. I can't over-emphasize how important digital marketing has been and continues to be for Offramp's growth. We aggressively maintain our email list, keep our website up to date, and stay actively connected to friends, fans and collectors via social media and blogging. It's relatively inexpensive and very effective. I've run Offramp for three years without a salary, supported by a modest inheritance, my wonderfully generous life partner, Chaz Alexander, as well as friends and the multi-talented, hard-working artists who show at Offramp. I'm very optimistic that Offramp will turn the corner in the next couple of years and become profitable. In the meantime, I can honestly say that running Offramp has been the most wonderful, most rewarding, three years of my life. Great post, Jane. I'm sorry I didn't meet you at FS, I curated and participated in POD. I thought it was a great show and experience and enjoyed the fact that the emphasis was not selling but on connecting. The three PODS your gallery had were great and it was encouraging for unknown artists to be able to show next to your gallery. Nice work Jane, I enjoyed both posts from my iPad at work. I hope that you sold something at FS and I am sorry to hear of your loss. Former professors are so influential on our lives that they often have more to do with our makeup than our parents and peers. Sorry to hear about Aron Goldberg. I enjoyed meeting him and learning about his work.